Captain Uriel Ventris fights to prove that he is worthy to return to the hallowed ranks of the Chapter after his exile to the Eye of Terror, and that he is free of the insidious taint of Chaos. But as the Iron Warriors move against Ultramar, a grim premonition comes to light: Ventris will have a part to play in the coming war, for good or ill.
It’s not an easy life being a Space Marine in the armies of the God-Emperor. First you have to earn you captaincy when your mentor is killed by the Night Lords, then you have to defend a world against the ravening hordes of the Great Devourer. And just when you’ve successfully done that, you get send on a Death Oath into the Eye of Terror because you didn’t do it according to your Primarch’s Codex Astartes. Yes, it’s not easy being a warrior of the Ultramarines Chapter, and I’ve certainly put Uriel and Pasanius through the wringer in their adventures to date. But who said being a Space Marine was supposed to be easy? The first three Ultramarines novels were written in my early years as an author, when I was just beginning to learn how you went about writing a book. Back then I had no idea if I had any longevity as a novelist, and I was pretty much going from novel to novel, planning each one out as its own entity, with no real thought as to what I might do next or how one might lead into another. The idea of ‘arcs’ seemed a little beyond what I was aiming for, but as my confidence as a writer grew and I saw that people were really responding to my take on the Ultramarines, I knew there was now a real need to plan further ahead than just the end of the book I was currently writing. Given where Uriel and Pasanius ended up at the end of Dead Sky, Black Sun, it was a given that I couldn’t start the next Ultramarines novel with them just walking up to the gates of the Ultramarines Fortress Monastery and telling their battle brothers that they were home and had they missed much…? No, their journey back had to be more troublesome than that, and not only did it have to be a physical odyssey, but it had to be a spiritual one too. It’s one thing to go to the Eye of Terror and make it out alive, but how would Uriel and Pasanius deal with the horrors they’d seen there? And how would the rest of the Chapter deal with their return? After all, nothing good ever comes out of the Eye of Terror, does it? And that’s where the <Censored by the Holy Ordo Malleus> came in, but I won’t say too much more on that for fear of spoiling the surprise. It was immediately obvious to me that their journey back from the Eye of Terror would take more than one book to tell, and thus the notion of the arc returned to me. I felt confident that I could tell this story over several books, increasing the danger, the stakes, the cast list and the ante each time. I thought long and hard what that arc would be, before coming to understand that the characters’ journey back – in all senses – should be the arc itself. The three novels contained in this omnibus represent the ‘voyage home’ arc of Uriel and Pasanius, with each one having a deliberate build in scale through the telling. In The Killing Ground it’s just Uriel and Pasanius in battle, but in Courage & Honour it’s the 4th Company, and in The Chapter’s Due, the whole of the Ultramarines Chapter gets in on the action. That was very deliberate, as I wanted the scale to grow between books to the point where it would span several systems and multiple viewpoints in a real humdinger of a finale. The latter novel is also a culmination of an aspect of the books I’d wanted to develop for a while. Up until now, the books had primarily focussed on my two main protagonists, Uriel and Pasanius, with a few supporting characters drifting through their orbit as the need arose, but that was all set to change. In Courage & Honour, I broadened the scope of the action to include the rest of the company, so the book became less ‘A Uriel and Pasanius novel’ and more ‘An Ultramarines novel’. Expanding the cast list allowed me to broaden the scale of action, and that’s best exemplified in the three main story strands of The Chapter’s Due, where we follow Uriel and Pasanius on Calth. Given that Pasanius was now fully reinstated as a sergeant, I needed some other characters around Uriel, and thus were born the Swords of Calth, his command squad. I had immense fun writing those guys, and they’ll definitely be returning in future stories. So with the three books contained here, you have a developing storyline which, rather than being three individual stories (though each one is totally self-contained), is one story broken into three parts. 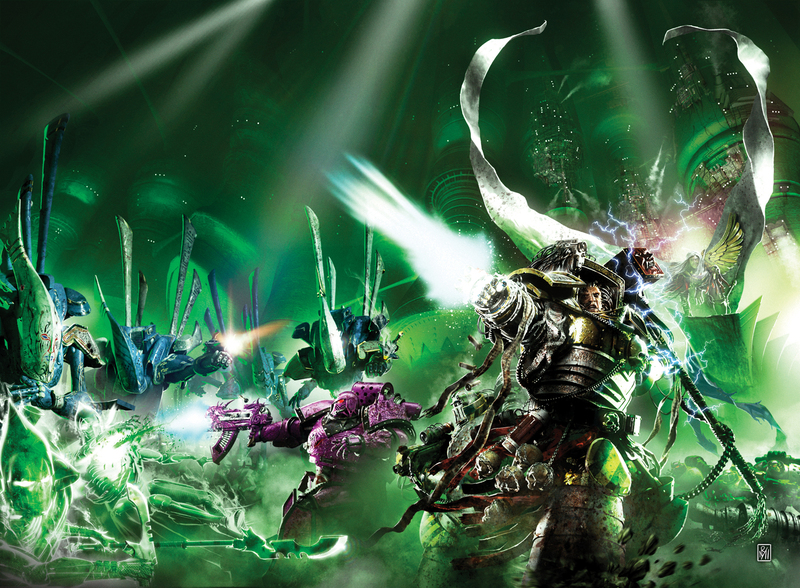 Many of the threads coming loose in these books will continue to fray dangerously in the next novels I have planned for the Ultramarines, and, trust me, it’s going to be awesomely epic and epically awesome. Uriel and Pasanius will march again!